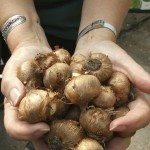 is a popular addition to flower gardens, and for good reason. It’s a perennial that climbs effortlessly and should reliably produce cascades of bright blooms for years. But when exactly can you expect these blooms? There’s no easy answer to this question, as the wide range of varieties bloom at such different times and for such different durations. 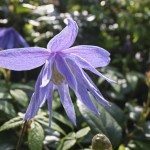 Keep reading for a basic rundown of clematis vine flowering times. There are a huge number of clematis species, all with slightly different blooming idiosyncrasies. Some clematis bloom times are in the spring, some in summer, some in autumn, and some are continuous through multiple seasons. Some clematis also have two distinct blooming periods. Even if you do plant a specific variety for its bloom time, sunlight, USDA zone, and soil quality can cause it to deviate from your expectations. There are some basic guidelines, however. 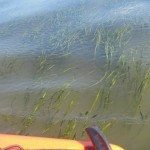 The florida species blooms once in the spring, stops producing, then blooms again in the autumn. Planting one of these is a good way to ensure clematis vine flowering for an extended period of time. Another good strategy is to overlap multiple varieties. 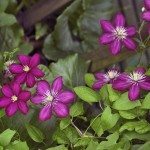 Even if you can’t exactly pinpoint your clematis bloom times, planting a spring variety near summer and fall varieties should make for continuous flowering throughout the growing season.